Schoolchildren in the impoverished Cite Militaire Neighborhood of Port-au-Prince. 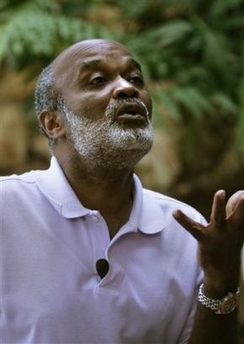 Rene Preval, a fiery leftist with an egregious human rights record who always considers the Haitian presidency as a criminal enterprise naturally shifting to the boss in ascendancy, is again a candidate for president of dirt-poor Haiti - nearly two years after the downfall of his senior partner in crime, Jean-Bertrand Aristide - in the elections of February 7, 2006, which carries in both a domestic and regional context tremendous significance. Preval, who in January 1999 dissolved parliament and gave himself unlimited power to form a government by decree, surely holds a place of honor in the annals of Haitian murderous dictatorship, and on many occasions has visited with the Cuban genocidal dictator, Fidel Castro - his candidacy is, for sure, more than a radical attack on Haitian dignity and democracy, and a deep threat to the United States. There are solid reasons for saying so. In his 1996 comedian-like presidential inaugural address, he promised Haitians that his five-year term would produce hundreds of thousands new employment opportunities in the construction industry. If any other good would come from his largely illegitimate government, it would be that of "re-establishing the authority of the state." It is no doubt true, since inane Preval has acknowledged he failed, according to a January 17, 2006 Associated Press article, reported and written by Michael Norton, that a second presidency of Preval (a come-back monster) is indicative that a significant number of chapters to the Haitian book of multitudinous painful problems will be added. The chapters that will be added to the book just mentioned above will not only be long, but the subject matter painful, and will show no way out of kidnappings, terrorism, drug trafficking, and, especially, anti-United States sentiment. What's more? 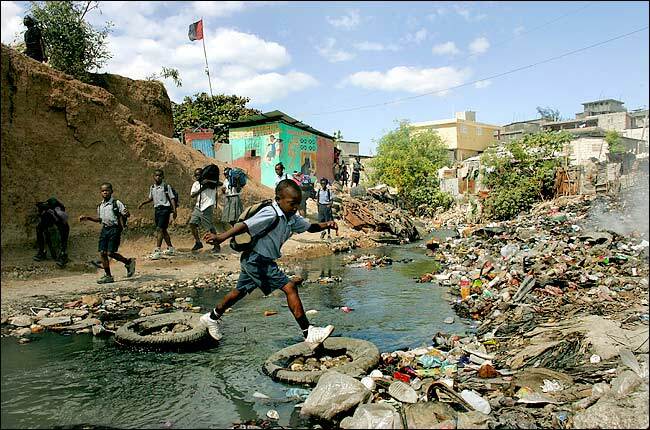 Blanket dehumanizing poverty, grand thievery, gross incompetence and many more of the same nature and gravity will increasingly continue to define the quality of life enjoyed by nearly all Haitians. Overall, this will keep old and new cleavages in ferment, also transcending into more Haitian boat people, particularly for the state of Florida. Preval, a largely inarticulate man alleged to drink vodka for breakfast, a womanizer, and, yes, a failed neighborhood baker, is, too, a former corrosive totalitarian dictator, hell-sent ferocious dictator and famous druglord Aristide's "yes man," meaning that the latter will still be there, at least by proxy. So many are mentally unstable Aristide's apparent drug ties, and approximately ten of his former government senior officials, including his palace security chief Oriel Jean and prominent members of his political party Lavalas (literally, Flood), are now serving long prison sentences in the U.S. for trafficking in illegal substances, that is narcotics. The first rule of holes is: since chief bandits Preval and Aristide (he distributed at least 27,000 firearms), and cruel ones at that, have conjointly further forced nearly all Haitians into an extremely painful one (cataclysm), stop digging. There is absolutely nothing that gives nourishment to Preval's daring principal presidential campaign slogan, "with me Preval, you all Haitians can be hopeful." And that is the reason why Haitians must, with the power that their votes confer them, overwhelmingly write the political obituary of Preval. By way of simplistic explanation, "We do not want you as our next president." Otherwise, they are incapable of taking a decisive step to intelligently begin addressing the multitude of growing painful problems, which for more than 200 years have stunted their progress; so damned they are they continue to plant with land mines the road for a reinvented Haiti. In the phrase of Vladimir Lenin, they will be perceived as "useful idiots." "Liberty is a long distance race," said Albert Camus, a French existentialist. Not permitting yourself to be further ensnared by an immeasurably barbaric man who possesses the perfect credentials for death, and savagely so, will certainly permit you to be hopeful that in the near future you will begin to journey to democratic rule and improve your material conditions - as insignificant they may be, by Western world standards.